fi.d.o has speakers for ears, a face that’s a talking LCD screen, and a see-through window into his belly, where a magical mechanism creates the perfectly engraved tag for your favorite pet. Phoenix, AZ, July 20, 2010 --(PR.com)-- fi.d.o (notice the I.D. in the name), is an innovative new kiosk system for creating personal pet identity tags that has customers mesmerized and pet tag sales soaring. It will be showcased at the Arizona Technology Council Partnering Conference scheduled for July 22 at the Scottsdale Hilton Resort and Villas. The public is invited and attendees will get a chance to experience the kiosk and receive a free customized pet tag. ATOMdesign, a Phoenix-based product development and branding firm partnered with The Hillman Group to develop every facet of this inspiring new kiosk system that replaces the company’s legacy product line currently in National Pet chains and retail mass merchants across the nation. fi.d.o has distinct advantages for consumers and retailers alike. Consumers can’t miss or resist the loveable ultra-modern dog-kiosk drawing them over to take a closer look—and when they do, they’re hooked. Everyone wants their pet to be easily identified in case they ever get lost. Here is a practical and fun solution that provides an engraved, durable high quality tag that will last for years. Pick out any one of the numerous, uniquely-shaped or colored tags, make the purchase and insert it into the transparent “belly,” as the fi.d.o character guides you through the steps using the touch screen, then watch as your tag is customized precisely on both sides as you wished. Retailers see fi.d.o from another perspective. What was once a rather dull necessity, identifying a pet, has now become a family event. 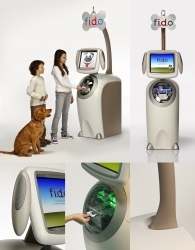 An alluring kiosk compels the customer to approach and make the purchase. The system takes up a bare minimum of precious square footage while maximizing the entire experience. The unit is safe, attractive, and the design provides easy access for maintenance. Best of all, the character-kiosk has significantly increased same store sales of pet tags during beta testing. The kiosks and tags are manufactured by the Hillman Group, based in Cincinnati, Ohio, and are being deployed nationally throughout the National Pet chains. Several Pet stores in the Phoenix metro and southern California area already have the kiosks and participated in the beta testing. ATOMdesign is a pioneering, full service product innovation firm specializing in the commercialization of emerging technologies and markets. Headquartered in Phoenix, ATOMdesign prides itself in its ability to not only get a product on the shelf but off the shelf into consumer hands. Services include market research, product design, engineering, prototyping, packaging, manufacturing sourcing, branding, marketing, and advertising. www.atomdesign.net. Click here to view the company profile of ATOMdesign, Inc.
Click here to view the list of recent Press Releases from ATOMdesign, Inc.